Brighten up and energize the look of your eyes. 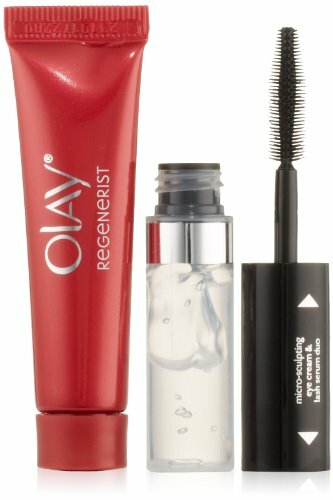 Olay Regenerist Micro-Sculpting Eye Cream and Lash Serum Duo is a 2-step treatment, specifically designed to reveal eyes that “wow!” The Olay Regenerist Lash Serum instantly thickens and enhances the appearance of your lashes. Simultaneously, the Eye Cream, featuring an advanced amino-peptide + B3 complex that penetrates deep into the skin’s surface, treats the area around your eyes for firmer, younger-looking skin. Simply massage in a small amount of eye cream to brighten and firm skin’s appearance. Next, apply the Lash Serum as you would mascara to instantly thicken and define the appearance of lashes. After letting the serum dry, your eyes are ready to “wow!” Or, if you’d like an even bolder look, you can finish with your favorite mascara. Olay Regenerist Micro-Sculpting Eye Cream and Lash Serum Duo is everything you need for younger, energized-looking eyes.